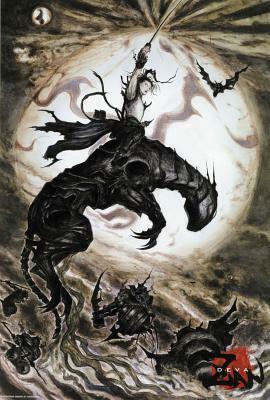 In his forty year career, Yoshitaka Amano has illustrated many projects, becoming famous for Final Fantasy and Vampire Hunter D. But never before has Amano written the visions he depicts – never until now! Dark Horse has the honor to publish Deva Zan, Yoshitaka Amano’s first fantasy novel as an author as well as an illustrator! An epic ten years in the planning, Amano has made Deva Zan as his personal expression of the legends of Asia for his Western readership. In esotevic Japanese Buddhism, twelve generals – the Juni Jinsho – stood guard over the cosmos at the points of the zodiac. But now they have vanished, and nothing stands between us and the forces of darkness but Deva Zan, a samurai without a memory. To restore order to existence, he must marshal not only his own fighting skill, but find companions that can cross the boundaries of time and space – to join him in a battle that will stretch from the fields of ancient Japan, to the streets of modern New York City – and to dimensions beyond human comprehension! Stunning. Sorry I have been a fan since 4th grade. The Artwork for this insanely magical graphic novel is phenomenal. Seriously you need to take a look at this just for the artwork alone. The Story is based on Buddhist mythology. The beginning was slow and a little confusing at times but, progressively and quickly it gets easier to understand and the plot moves into an even flow. I don’t know if I’ve said this before but I’d much prefer a rocky beginning and a spectacular ending; than an awesome start and a mediocre end. So yeah the Story unfolds slowly and it takes a while to get adjusted but it’s worth the read. Deva Zan is multilayered and it asked a lot of philosophical questions. Devan Zan reminds me of what Jack Zipes and Angela Carter does for Faerie Tales. Re-envisions them into modern folklore. This was a really interesting experience and I recommend it especially to Yoshitaka Amano’s fans.